"There's people here. They're all bleeding. They're gonna die," the caller said. Dramatic 911 calls released by the Coral Springs Police Department reveal a terrifying scene inside a classroom where suspected Florida school shooter Nikolas Cruz opened fire in the Feb. 14 massacre that killed 17 people. As one 911 call begins, commotion and whispering are heard in the background before a female voice tells the dispatcher, "Please. I can't breathe." The operator asks multiple times where the caller is, and she finally answers, "Stoneman Douglas High School." "There's a shooting here," the caller says, after the dispatcher asks what's going on. "Please, I'm begging you. Please." The operator then tells the caller, who can be heard crying heavily, that help is on the way and instructs her to stay on the phone. "Please. There's people here. They're all bleeding. They're gonna die," the caller says, informing the dispatcher that they are in the high school's freshman building. When the dispatcher asks the caller if she saw the shooter or if she was injured, she replies, saying there are holes in the wall and that the shooter is upstairs. The female also said that she wasn't injured but that there was "a lot of people" who were. The caller then reveals that she thinks that a male in the classroom is dead. She says, "Someone got shot in the head" and "someone got shot in the stomach." She says that she can't attempt CPR because she can't go near the victim and the shooter is "coming back" in the hallway and that at least three people are hurt. The operator instructs her to "stay quiet and keep the door shut" and to climb into a closet if they can. "Make sure nobody in your class moves an inch, you got it?" the dispatcher says, telling the caller that help is now on campus. 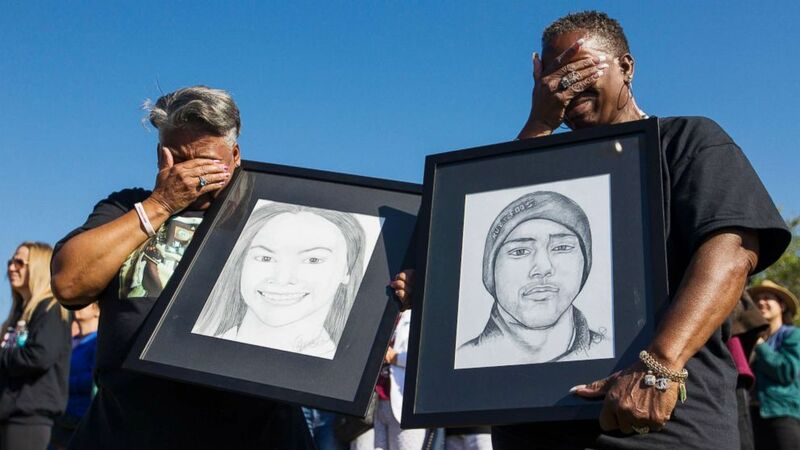 (Matias J. Ocner/Miami Herald via AP) Pat Gibson, left, and Valerie Davis cry while holding pictures of two of the victims killed in the Parkland shooting during the one-month anniversary walkouts to protest gun violence, outside Marjory Stoneman Douglas High School, March, 14, 2018. More than 16 minutes into the phone call, the caller then says that the police were finally in the classroom, and the operator tells her to "go talk to them" before the call ends. Other calls showcased the fear as students and staff waited for help. 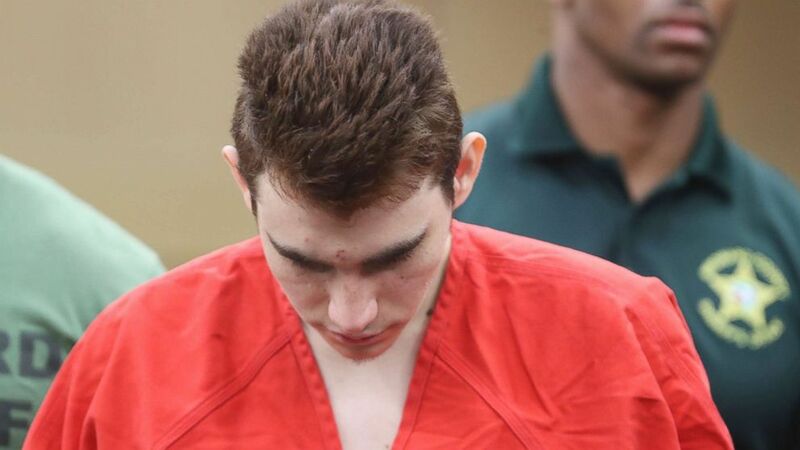 Cruz was formally arraigned Wednesday on a 34-count indictment related to last month's mass shooting at a South Florida high school, for which the 19-year-old is now facing the death penalty. Cruz was escorted into the Broward County courtroom in shackles and wearing a bright orange-red prison jumpsuit. He sat silent on the courtroom bench and kept his head bowed down throughout the hearing, as sheriff's deputies stood guard behind him. Broward County Judge Elizabeth Scherer entered a not guilty plea on Cruz's behalf, after his lawyers indicated he would stand mute, or refuse to plead either innocent or guilty. Defense attorney Melisa McNeill emphasized to the judge that Cruz remains willing "at any time" to plead guilty "in exchange for a waiver of the death sentence" and instead spend the rest of his life behind bars. (Amy Beth Bennett/South Florida Sun-Sentinel via AP) Nikolas Cruz is lead out of the courtroom after an arraignment hearing at the Broward County Courthouse in Fort Lauderdale, Fla., March 14, 2018. Cruz allegedly opened fire at Marjory Stoneman Douglas High School in Parkland on Feb. 14, killing 17 people and injuring others. 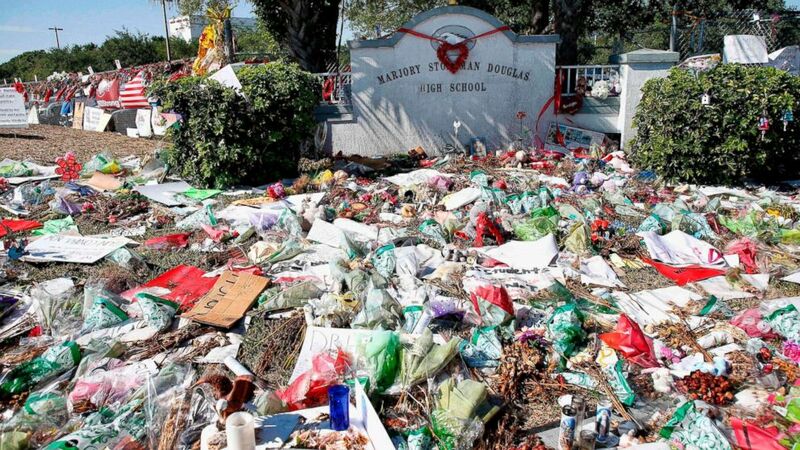 He was expelled from Marjory Stoneman Douglas High School over disciplinary problems last year. The AR-15-style rifle allegedly used in the massacre was legally purchased by Cruz a year ago, authorities said. 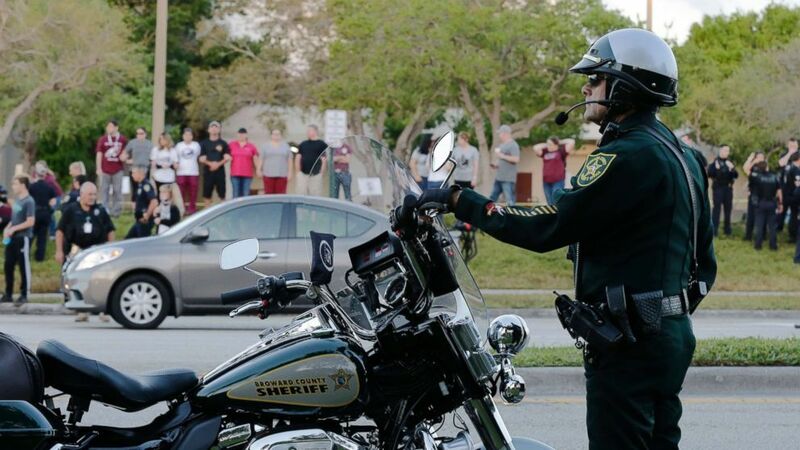 (Terry Renna/AP) A police officer stands watch at Marjory Stoneman Douglas High School in Parkland, Fla., Feb. 28, 2018. Students returned to class for the first time since a former student opened fire there with an assault weapon. Last week, the Broward County State Attorney's Office announced a grand jury indictment charging Cruz with 17 counts of first-degree premeditated murder and 17 counts of first-degree attempted murder. He is being held without bond on all counts. The state attorney for Broward County, Michael Satz, announced Tuesday that he had filed a notice of intent to seek the death penalty in the case against Cruz. 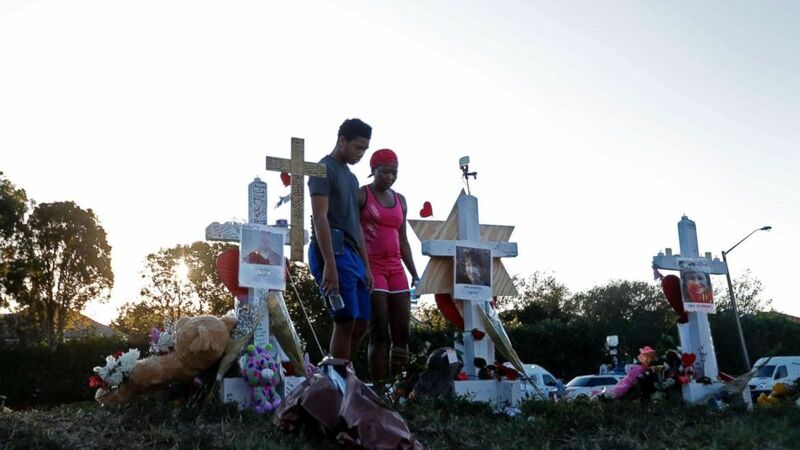 (Gerald Herbert/AP) Denyse Christian, visits a makeshift memorial with her son Adin Christian, 16, a student at the school, outside the Marjory Stoneman Douglas High School. Broward County public defender Howard Finkelstein, whose office is representing Cruz, said the move didn't come as a surprise and he reiterated his client's willingness to plead guilty if prosecutors take the death penalty off the table and agree to a life sentence in prison instead. “It was not unexpected," Finkelstein told ABC News in a statement Tuesday. "We still stand ready to immediately plead guilty to all counts -— to 34 consecutive life sentences without parole." Cruz is scheduled to appear again in court on April 27, three days before his trial begins. ABC News' Rachel Katz contributed to this report.